The KCATA picked up an award this week honoring our new 3-Trails Transit Center that’s nearing completion in south Kansas City at Blue Ridge Boulevard and Bannister Road. 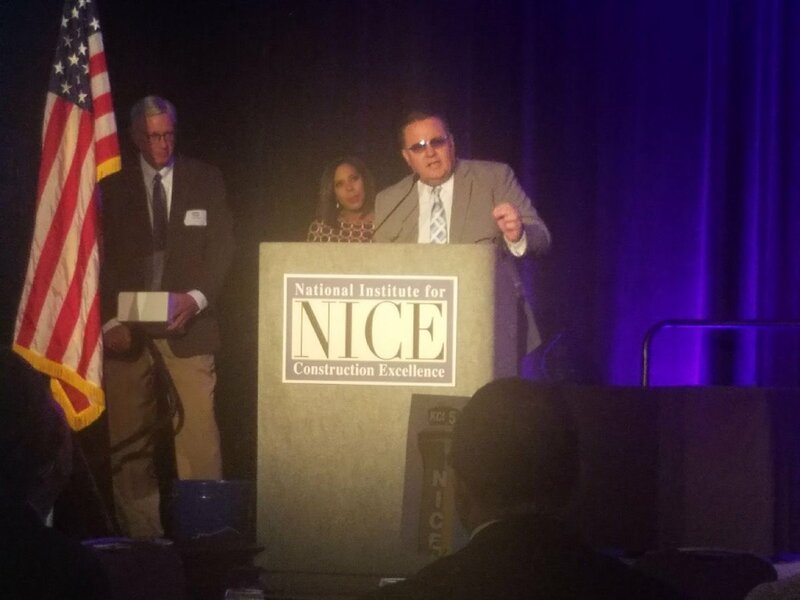 The National Institute for Construction Excellence, founded in 1998 to raise awareness about careers in the skilled trades, presented the "Construction User" award to the Kansas City Area Transportation Authority at a luncheon Oct. 17 at the Marriott Muehlbach Hotel. KCATA President and Chief Executive Officer Robbie Makinen accepted the award on behalf of the Authority. KCATA President and Chief Executive Officer Robbie Makinen accepts award for 3-Trails Transit Center. This award goes to a person or entity that is a leader in using construction services through its large scale development projects across the Kansas City region. The recipient of this award understands and exemplifies the relationship between investing in the growth of their entity and the positive impact that an investment has on the economic sustainability of the Kansas City region. The not-for-profit institute selected the KCATA because of our commitment to improving transit by providing new levels of service that create connectivity throughout the region. "We're pleased to be recognized for our work on the 3-Trails Transit Center," Makinen said. "This is the first award we have received from the construction/development community, and look forward to continuing to work collaboratively on future projects that so positively impact the community." The transit center will be a hub for six bus routes, including Troost MAX, 28 Blue Ridge, 29 Blue Ridge Limited and 75 75th Street. The National Park Service has already designated the transit center as an official trailhead for the California, Oregon and Santa Fe trails. Expected to be completed before Thanksgiving, the transit center will provide a free park-and-ride lot with 26 spaces, free public Wi-Fi, bike racks, lighted shelters, real-time arrival information signs, Smart City touch-screen kiosks and accessible ramps for riders with disabilities.